Volvo is developing new technology that claims to be able to improve safety by monitoring drivers' eye movements. Through systems that can recognise and distinguish whether a driver is tired or inattentive, the car of the future can become even safer, according to the Swedish manufacturer. Examples of this include technology that detect closed eyes or what the driver is looking at. “This will enable the driver to be able to rely a bit more on their car, and know that it will help them when needed,” said Per Landfors, engineer at Volvo Cars and project leader for driver support functions. Volvo says by placing a sensor on the dashboard to monitor aspects such as in which direction the driver is looking, how open their eyes are, as well as their head position and angle, it is possible to develop precise safety systems that detect the driver’s state and are able to adjust the car accordingly. This also means that the car will ensure that it does not stray out of the lane or get too close to the car in front when the driver is not paying attention, as well as being able to wake a driver who is falling asleep. “Since the car is able to detect if a driver is not paying attention, safety systems can be adapted more effectively. For example, the car's support systems can be activated later on if the driver is focused, and earlier if the driver’s attention is directed elsewhere,” Landfors added. Some of the current systems that can be included are lane keeping assistance, collision warning with full autonomous braking and adaptive cruise control with queue assist (which automatically accelerates and brakes when the vehicle in front does, and stays in lane by reading road markings). The technology is based on a sensor mounted on the dashboard in front of the driver. Small LEDs illuminate the driver with infrared light, which is then monitored by the sensor. Infrared light is just outside the wavelengths that the human eye can see, which means that the person behind the wheel doesn’t notice it at all. Driver sensors are also opening up other possibilities. By monitoring eye movements, the car would be able to adjust both interior and exterior lighting to follow the direction in which the driver is looking, says Volvo. The car would also be able to adjust seat settings, for instance, simply by recognising the person sitting behind the wheel. The technology is already installed in test vehicles. 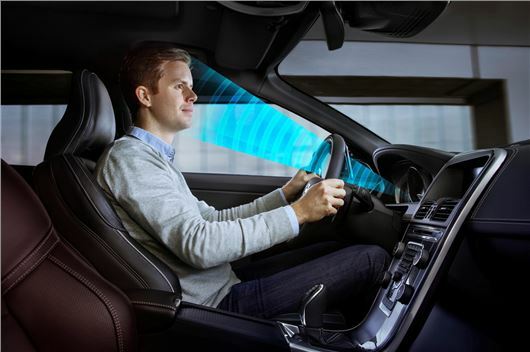 Volvo Cars is also conducting research together with partners including Chalmers University of Technology and Volvo AB to identify effective methods for detecting tiredness and inattention. The analysis of the driver’s state, known as Driver State Estimation, in which driver sensors play an important role, is a field that may be key to self-driving cars in the future. According to Volvo, the car will need to be able to determine for itself whether the driver is capable of taking control when the conditions for driving autonomously are no longer present.